When the budget is a little tight, it is important to make the right decisions when it comes to interior decoration and design. 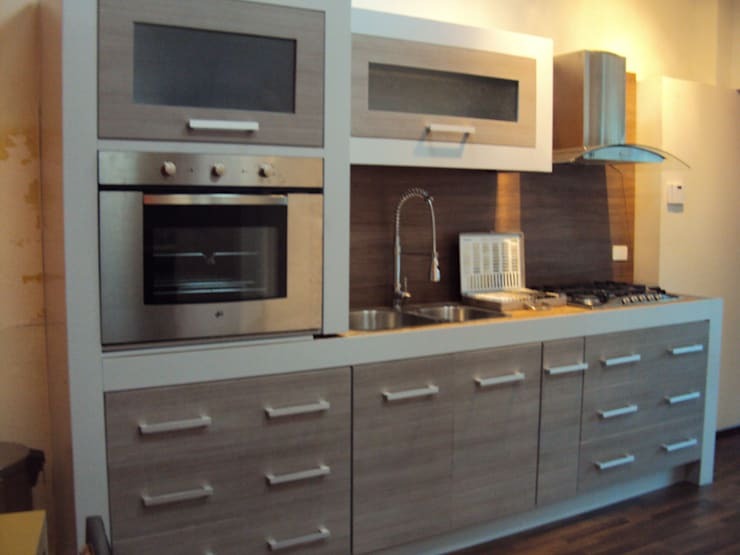 This is even more important when it comes to the kitchen space, as this room has particular prominence in any home. Having a clear idea of how you want your kitchen to look like from the beginning will save you many expenses and hordes of inconveniences. The constraints of time and budget can sometimes feel debilitating, and planning is the cure. On the other hand, people typically have enough time and money to create the kitchen of their dreams, but have no idea how they should begin to design it. This is very common and experienced by many, but should be no cause for worry. We here at homify will present you with 10 great ideas today that will activate your brain and allow you to think of the perfect kitchen design to create your own dream kitchen! 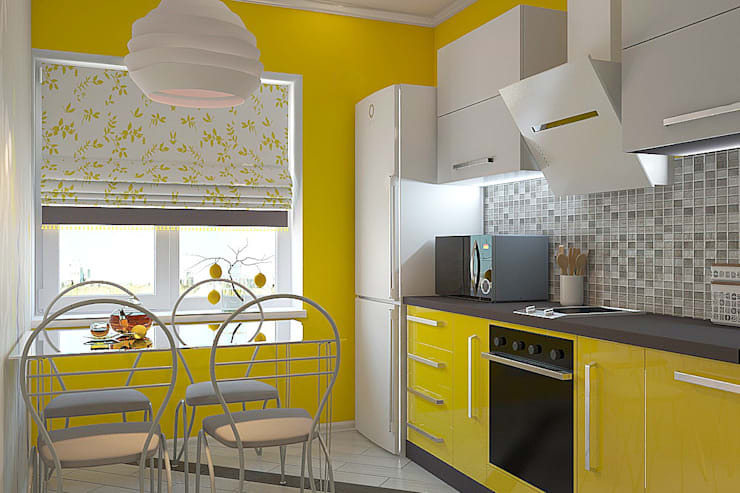 Furniture and appliances of steel or chrome are popular features in modern designs, but this time the designers wanted to give more personality to the design of this kitchen, adding two very bright colours with a soft tone in the background design. This choice of colours is not a problem, as long as the furniture is in much more neutral tones like white or light grey or even champagne. Wood is a much more classic choice, but will still not go out of fashion due to its flexibility and beautiful finish. You can create beautiful dark wood cabinets and then look for shades that contrast with the floor and the walls. 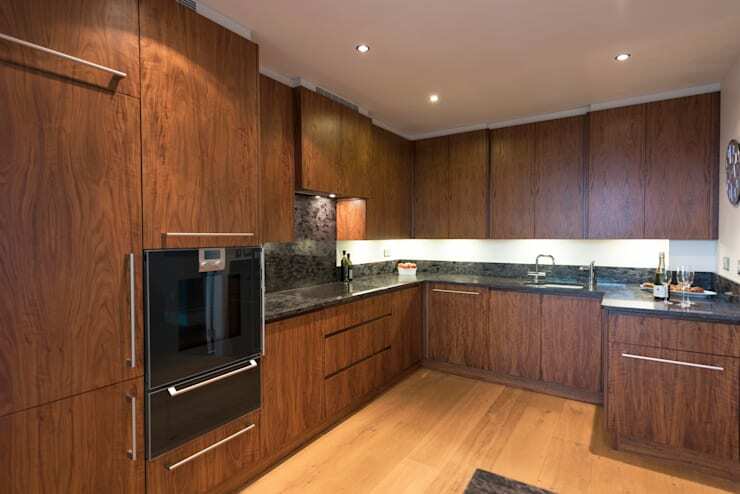 You must remember that if you use dark wood for your cabinets, the rest of the kitchen should have lighter shades to increase depth perception and make it more comprehensive. We should mention that proper lighting makes all the difference and even more if this light source is natural. 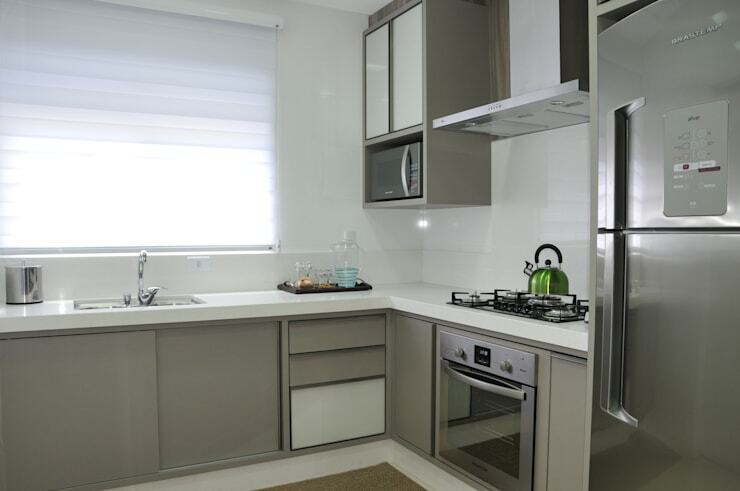 That's why you should not hesitate to build or renovate your kitchen so you can get a greater amount of light through it then control the intensity with a thick translucent curtain that will give the whole room a cosier and soft feeling to the senses. 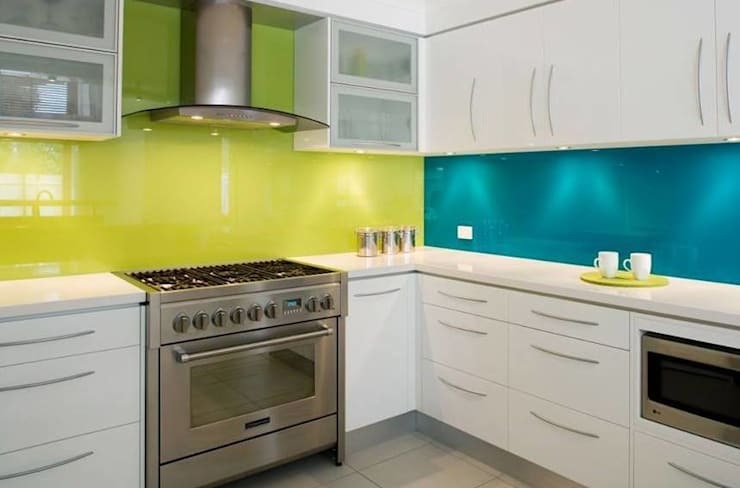 When building their kitchens, many people are afraid to choose the wrong colour for furniture and cabinets, but this is easy to solve, and you should not fear strong colours as long as you learn how to use them correctly. 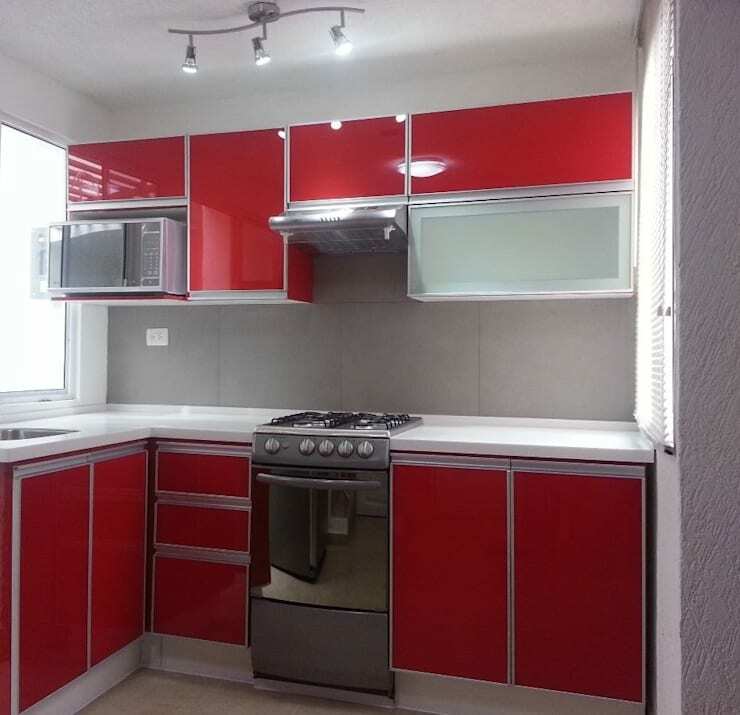 This kitchen has a grey background, which is a neutral tone that can be used as a base and adds more depth to the design, while the cabinets are set in bright red. As you can see, the red has a perfect contrast to the grey, while also being of the right dimensions to ensure functionality and style. Using natural materials has become a very popular trend with respect to the interior decoration industry. Creating a kitchen without adding a coating or some paint on wood or even concrete gives you the opportunity to create a space with a rustic and natural touch and even makes it look cooler—perfect for homes located in hot areas . 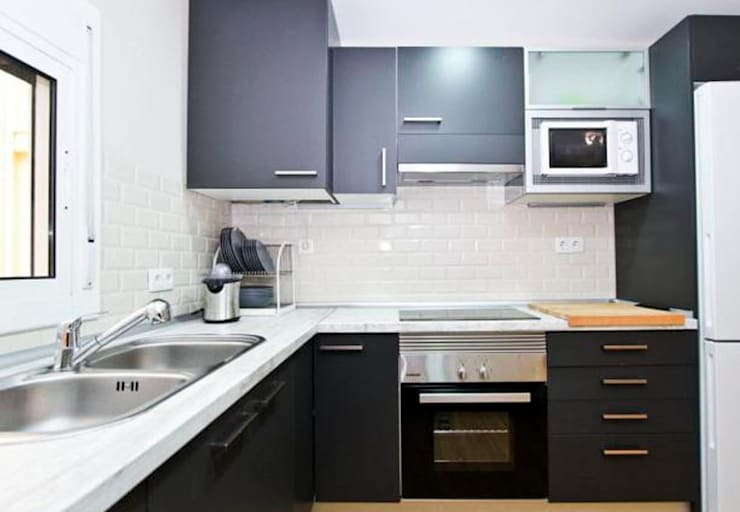 Many people love the idea of having a dedicated kitchen, but many times the space available in our homes do not allow for this, necessitating multifunctional spaces. 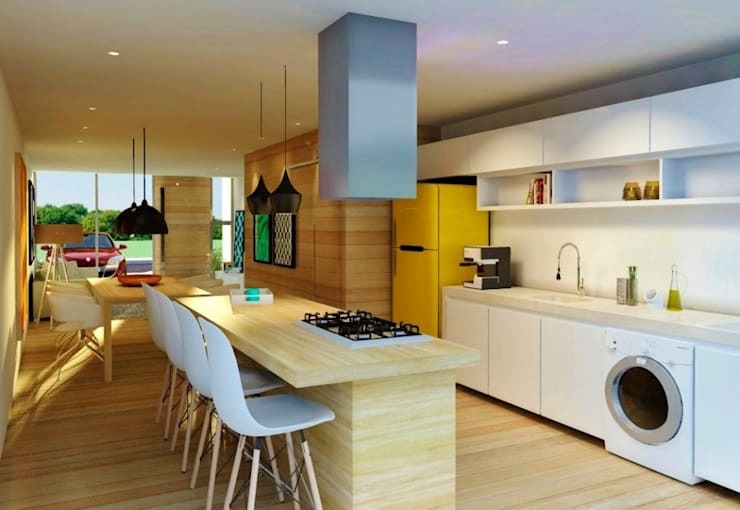 You can join your kitchen with your laundry area to create a multifunctional space. This is only possible, however, if you adapt your design to create a unique and harmonious area for everything to work together without problems. Everything must be taken into account when designing our kitchen, even the handles of our cabinets. Today is very popular to use light handles to create contrast on the tone of cabinets, but you can also install a smaller ones which may not be so dominant. Do not be afraid to be different or to try new things. Dynamic and creative furniture and decorations can be very good options indeed. In this picture, we can see how the decorators used beautiful steel chairs painted white with a peculiar back rest, in conjunction with ceramic tiles with a highly original print and a fun dome-shaped ceiling lamp. 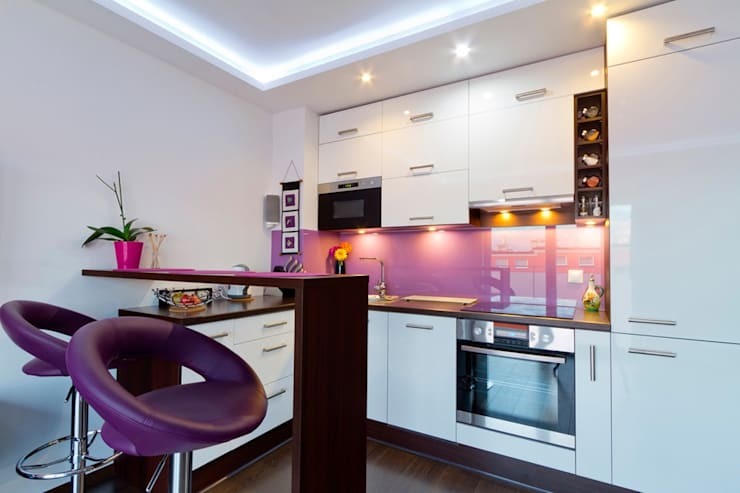 If you live in a small apartment, you don't have to leave behind the exclusivity and style you want in your home, and you can design a kitchen that suits your space, looking great. For these cases we suggest to use of light colours that help visually cool the space, and you can also ask a carpenter to manufacture narrower cabinets in order to install more, providing better storage spaces. If you are someone with a more daring style, feel free to translate it into your kitchen. In this picture, we can see how the designers have created a super-modern kitchen with smooth, shiny surfaces and touches of gleaming steel, not forgetting the beautiful electric kitchen is at one end of the island; but this kitchen also brings its own personality, thanks to the installation of a very colorful breakfast bar that not only highlights, but also points to the space given to its function. Let us know which was your favourite kitchen in the comments below.